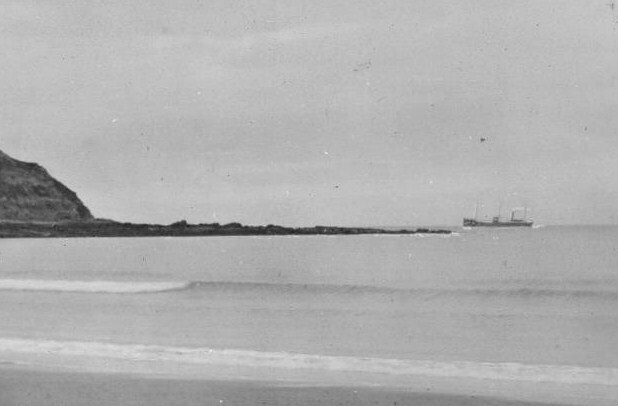 The first photograph shows the coaster SS Dora steaming at full speed off Nefyn Point around 1910. She was heading for Porthdinllaen. 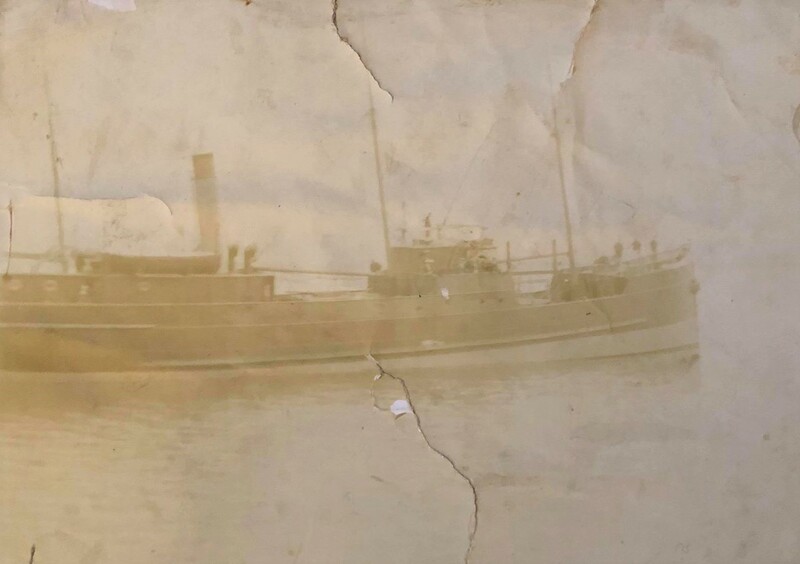 Dora was the last in the line of small ships, initially sailing ships and later steam ships (steamers) that delivered cargo along the coasts of North Wales. For fifteen years, the little steamer (stemar fechan) was a much beloved sight on her weekly visits to the Nefyn area. Unfortunately the little ship’s total lifespan was only seventeen years as explained below. She will not be forgotten in Porthdinllaen. The SS Dora steaming full speed ahead off Nefyn Point around 1910 and heading for Porthdinllaen. The Dora was owned by the Aberdovey and Barmouth Steamship Company and was based in Liverpool. The ship was built on Clydeside by Fullerton and Co. and was launched on June 28, 1900. She weighed 296 tons with a length of 130 feet, a beam of 23 feet and a draft of 9 feet. She had a two cylinder Ross and Duncan engine with a single propeller and she was registered with Robert Owen and Co in Liverpool. 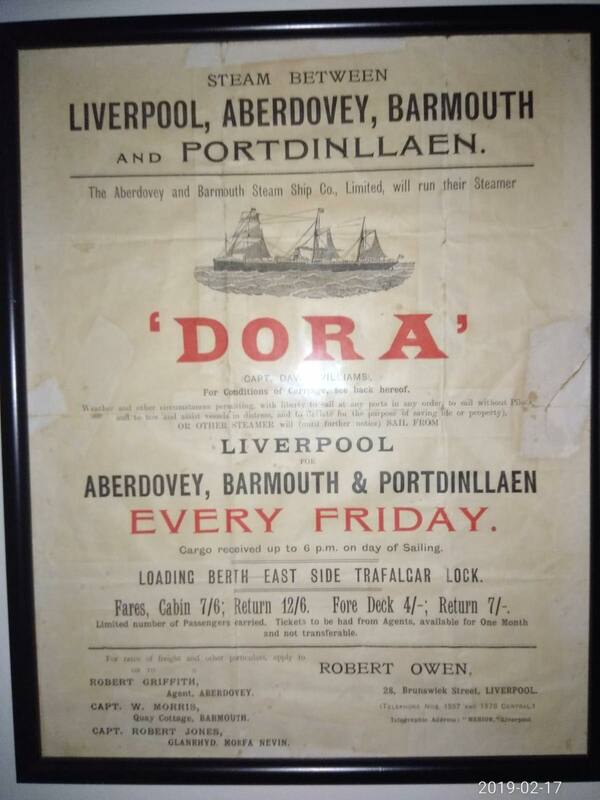 The Dora sailed regularly from Liverpool for Aberdovey every Friday with stops in Porthdinllaen on the north coast of the Lleyn Peninsula and stops in Barmouth and Aberdovey in Cardigan Bay. She would travel through the Menai Straits and then hug the coast down to Porthdinllaen. After unloading, she would swing out into the Irish Sea, proceed along the Peninsula and around Bardsey Island into Cardigan Bay. On occasions, the ship would also stop in Porthmadog. Her schedule on route was very much determined by the tides. She carried groceries, products, and supplies on the outward trip returning to Liverpool with livestock, wool, timber and manganese ore (used in hardening gun barrels). In Porthdinllaen, the ship docked at Pen Cim the small headland that separates Porthdinllaen village from Morfa Nefyn Bay. On the headland was a specially built warehouse-on-stilts which had been used by these coastal ships for many years. The Dora would pull up alongside and the cargo would be hoisted from the hold of the ship and stored in the warehouse. The cargo was then distributed via horse and carts to the shopkeepers and farmers in the Lleyn area. The Dora also carried passengers and she provided a convenient means for people to reach Lleyn especially those arriving in Liverpool on the much larger ocean-going vessels from overseas. Several of my five great uncles who emigrated from the Sarn Meyllteyrn area to Rome, New York used the Dora to get both to and from Liverpool. Holidaymakers from Merseyside and Lancashire frequently used the coaster to reach their holiday destinations. A group of scouts from Wigan Grammar School traveled on the Dora to their campsite in Abergeirch in August 1907. The weather was not cooperative and they were so glad to set foot on terra firma in Porthdinllaen after a very rough passage. They chose to return to Wigan by rail. The Dora had a crew of four, an engineer and three deckhands and they were all from the Aberdovey area. The Captain David Williams was from Morfa Nefyn. His father-in-law Captain Robert Jones was the company’s agent in Porthdinllaen. 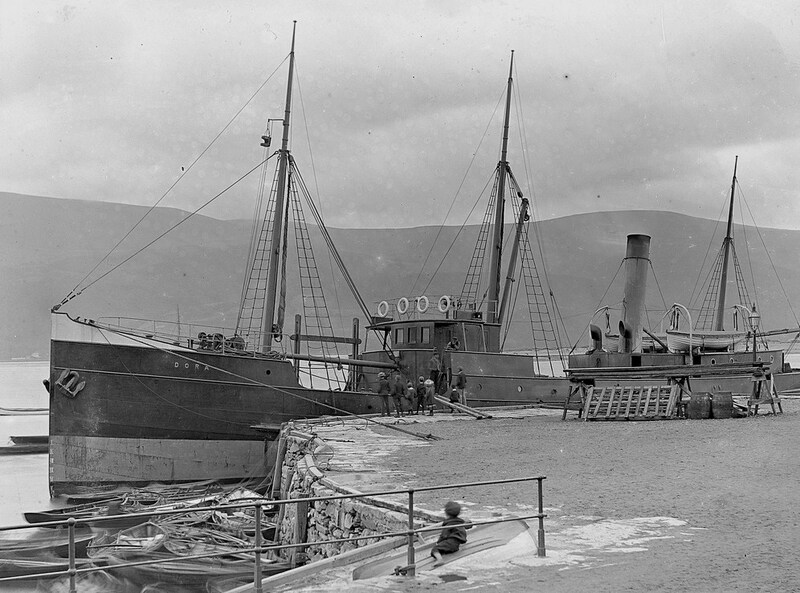 The SS Dora at anchor in Abermaw, Barmouth in 1901. Dora made her last visit to Porthdinllaen in October 1915. She was then commandeered by the British Admiralty and as part of the War effort was assigned to the Liverpool to Belfast crossing in November 1915. She never returned to the coastal waters of North Wales. On May 1 1917, as the SS Dora was returning from Belfast to Liverpool in ballast, she was intercepted by a surfacing German submarine in the Irish Sea. The incident occurred about eleven miles west of the Mull of Galloway. The submarine UC65, captained by Otto Steinbrinck, deemed the Dora too small to sink with a torpedo, so they instructed Captain Williams and his crew to take to the lifeboats. The Germans then boarded the Dora, placed explosives in strategic locations and scuttled the little ship. There were no casualties in the incident and the crew landed safely on the shores of the Solway Firth the following day. The submarine was aware of the schedule of the Dora from previous sightings and was lying in wait. The UC65 was responsible for the loss of a lot of shipping tonnage around the British Isles in WWI. The UC65 was herself sunk with all hands perishing by the British submarine C15 in the English Channel on November 3 1917. 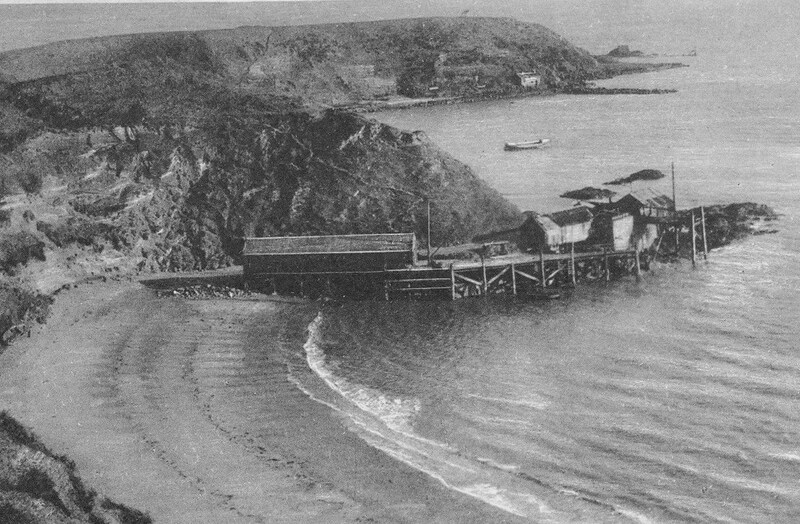 The warehouse-on-stilts on the small headland Pen Cim in Porthdinllaen and now referred to in Welsh as Warws Dora (Dora’s Warehouse). The people of North Wales were shocked when they heard the sad news about the loss of the SS Dora but grateful that everyone had survived the incident. Nostalgically, the warehouse in Porthdinllaen was thereafter always referred to in Welsh as Warws Dora “Dora’s Warehouse.” The warehouse now converted to a private dwelling still stands to this day as a fitting tribute to the gallant little ship that traversed the coastal waters of North Wales over one hundred years ago. 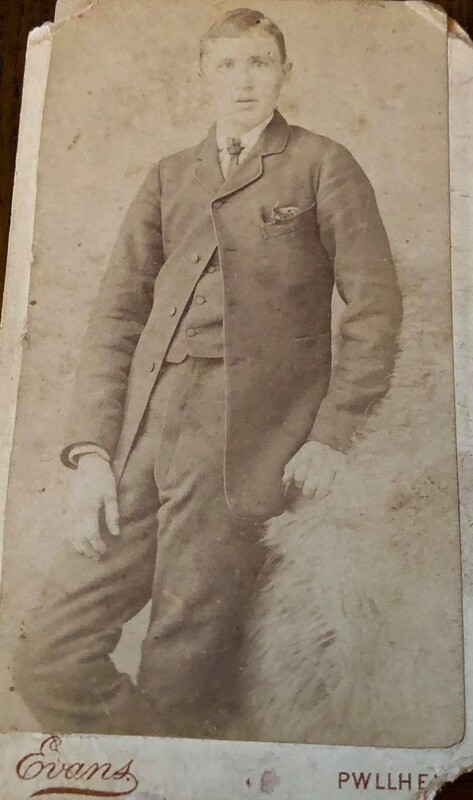 I was informed in early 2019 by descendants of SS Dora Captain David Williams that the family still lived in the Morfa Nefyn area. They had additional information on the Dora and the Captain which they were willing to share. All the information and photos below are therefore courtesy of Katie Hipwell and Claire Smith great grand-daughters of Captain Williams and their late father O G Williams (Gwyn) grandson of the Captain. The SS Dora poster above is very rare since it is the only known example. It shows how the Aberdovey and Barmouth Steam Ship Company advertised its coastal delivery services around the Lleyn Peninsula and down to mid-Wales in Cardigan Bay. The posters were prominently displayed to attract potential customers by the Registering Company Robert Owen in Liverpool, and by the Company Agents Robert Griffith in Aberdovey; Capt. W Morris in Quay Cottage, Barmouth; and Capt. Robert Jones in Glanrhyd, Morfa Nevin. A few observations from the poster are worth noting. The small print below the 'DORA' title reads “Weather and other circumstances permitting, with liberty to call any ports in any order, to sail without Pilot and to tow and assist vessels in distress, and to deviate for the purposes of saving life or property ...” Clearly an indication that the weather and tides played a critical role in arrival schedules. With such a rugged North Wales coast and so much coastal shipping traffic in the early 1900's, the ship was willing to provide assistance in any emergency situation at sea. The ship advertised leaving Liverpool on Friday evening and would hold until daybreak Saturday before navigating through the Menai Straits. I assume that with a regular weekly passage through the Straits, the Dora Captain was experienced enough to navigate the Swillies (the most difficult section of the Straits) without the assistance of a pilot. A passage on the Dora fore deck for four shillings would be pleasant with calm weather in the summer but a different story in a north-westerly gale in the middle of winter. If you were prone to seasickness, you might not be any better off in a cabin either for seven shillings and sixpence! Captain David Williams earned his Master Certificate in 1898 when he was 32 years old and became the skipper of the Dora in 1909. He was married to the daughter of the Morfa Nevin agent Captain Robert Jones. The photo above was taken around that time. Captain Williams was born and bred in the Morfa Nevin area and lived there all his life. He lived in his early years in a house called Angorfa and later in a house called Llys Alaw, on Tyn Mur Lane. The photos below show him as an 18 year old young man at the Evans photo studio in Pwllheli and the other when he was captain of the SS Wheatsheaf in Cork, Ireland in 1929. 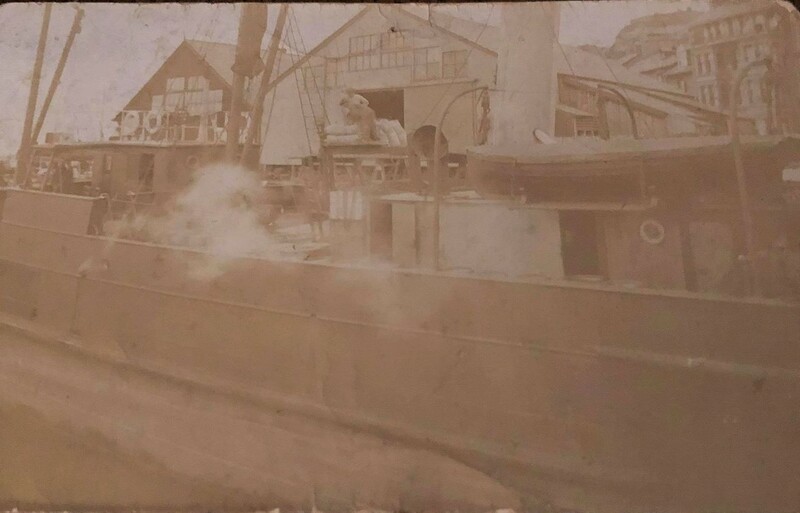 The other photos, which are regretfully a little unclear, show the SS Dora in Porthdinllaen Bay and unloading cargo in Porthmadog. 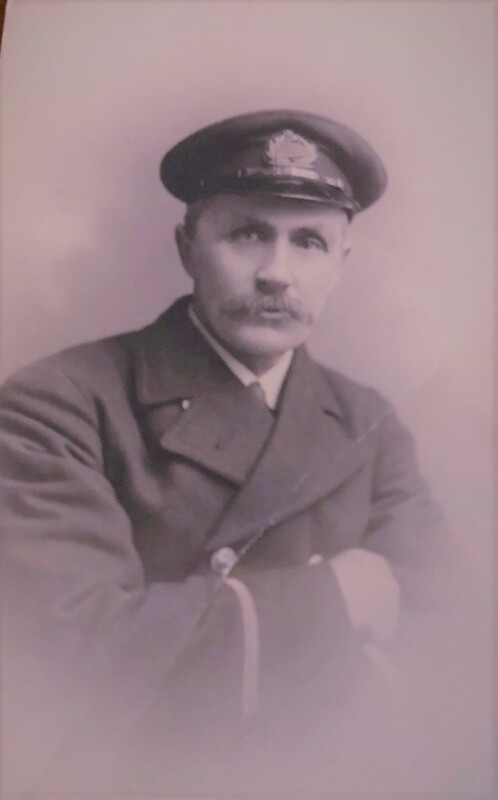 Captain Williams was a capable master mariner and with his expertise carried out his shipping responsibilities in the merchant navy very successfully. He more than proved his worth as captain when the SS Dora was confronted by the surfacing German submarine on the evening of May 1, 1917 off the Mull of Galloway. 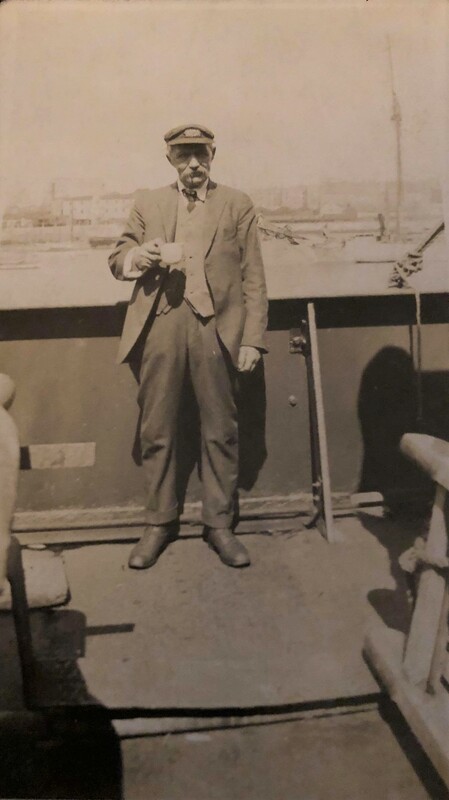 He remained calm and collected as he obeyed the German command to take to the lifeboats but not before taking the compass off the bridge of the Dora with him (the compass is now in the possession of his great grand-daughters). The Germans scuttled the ship and, contrary to normal practice, they did not harm anyone in the lifeboats and no shots were fired. Perhaps they were bewildered because the crew seemed foreign (they all spoke Welsh!) or they were eager to submerge quietly and rapidly in case the British Navy was alerted – who knows. The Captain made good use of the compass to reach the coast of the Solway Firth as quickly as possible by the following day to raise the alarm. After retiring from the merchant navy, Captain David Williams continued to live in Llys Alaw until he died in 1957 at the ripe old age of 91. He is buried at St Mary's Church Cemetery, Lon yr Eglwys in Morfa Nefyn.